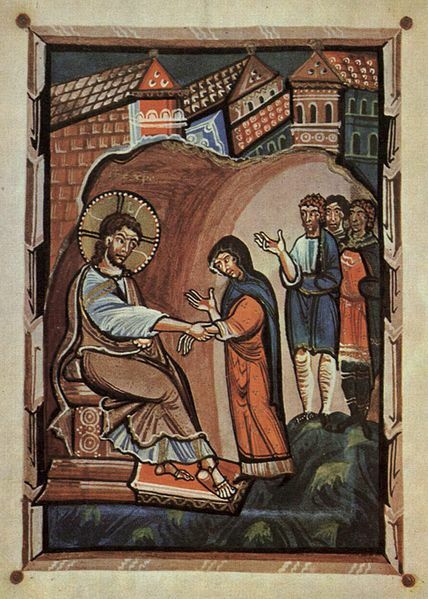 Here at the beginning of history’s central event – the advent of Jesus Christ – Mark records the healing of a mother-in-law. Mark sandwiches this event between the exorcising of a demon in the midst of Jewish worship (our reading last week) and huge crowds bringing other demon-possessed and physically ill people. Peter’s mother-in-law shows the proper response to Jesus’ touch: service prompted by gratitude and devotion. What Jesus has done in the synagogue spreads like a firestorm. The people could hardly wait for the Sabbath to end, as signaled by the first three visible stars. So at sunset, a flood of people come to Jesus, carrying or leading their sick, confused and maimed friends and family members. With compassion and power Jesus responds. Many can speak with a semblance of power, but few are able to follow through with deeds of power. Jesus produces results. After telling of the first busy day of Jesus’ ministry, Mark now shows us the secret of Jesus’ effectiveness – solitude and prayer. In his baptism, Jesus identifies with people who are aware of their separation from God and who desire to return. Only Jesus’ consistent, personal, spiritual practice of spending hours alone with God can sustain him in his mission of identification and atonement. After the time of quiet, Jesus is ready to abandon the immediate adulation of the crowds (1:37) in order to fulfill his greater calling. Everyone indeed is searching for Jesus. We are called by our baptism into Christ to the ministry of healing. Intercessions at the Eucharist are embodied by the baptized as they care for one another and as they witness to Christ’s healing among them. We pray for those in any need of any kind of healing in the Prayers of the People (BCP 383-393). Compare today’s Church members to the crowds that were attracted to Jesus. How would you characterize Jesus’ style of ministry? How might this be adapted to your church’s ministry in the world? Describe your spiritual practice. Name your lonely place. In what ways does the time you spend with God prepare and empower you for service? What do you think Jesus’ followers want him to do in verse 37? Why? What form do you think this voice takes in the Church today? What kind of confidence enables Jesus to leave the success at Capernaum? This entry was posted in Epiphany and tagged Epiphany, First Epistle to the Corinthians, healing, Jesus, Lectionary. Bookmark the permalink.